My post on GGW about Alexandria Bikeshare is now online. The maps I posted yesterday are in there, as is some details from last night's City Council meeting and discussion of the program. Just wish we could get the stations in sooner than Spring. A quick word now before I wrote a longer post for Greater Greater Washington tomorrow: Alexandria City Council unanimously approved joining the Capital Bikeshare system. First 6 stations to be implemented sometime between spring and summer 2012. 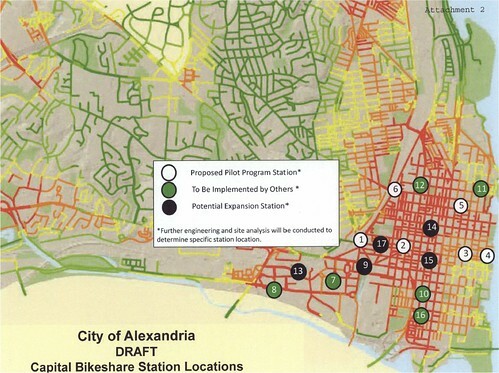 The Alexandria City Council is expected to vote tonight on whether to join Capital Bikeshare. The docket item is now online. 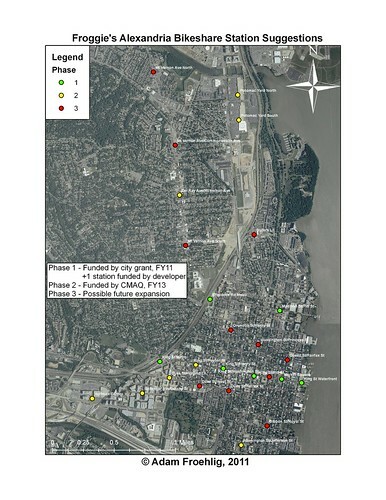 The initial round of 6 Bikeshare stations (with 54 bikes) is to be funded via already-approved FY 2012 CMAQ funding, with operating expenses to be covered from the city's pot of Transportation Management Plan (TMP) funds. No city general funds will be used, and the docket is quick to make that point clear. This graphic is from the City Council docket item for tonight's council meeting, showing the draft list of proposed stations. The white circles on the map are for the initial round of six bikeshare stations. Green circles are "To Be Implemenented By Others", likely developer-funded stations as there has been considerable interest among developers and property owners for including Bikeshare stations...as an example, the recently approved Harris Teeter development in North Old Town offered a Bikeshare stations as part of the new development. Black circles show future expansion locations. This is of note since Council approved FY 2013 CMAQ funding on September 27, including $400K for Bikeshare. The street shading is from the city's map of Potential Bicycle Activity (page 6), from the city's Pedestrian and Bicycle Mobility Plan. It's basically their version of a "heat map" identifying potential areas of bicycle activity. It could also be used to identify potential locations for Bikeshare stations. Not much difference between the city's proposed initial round and my own. We both put stations at the King St and Braddock Rd Metro stations, but while I put the rest of the stations along King St, the city puts one in at Pitt and Pendleton. The city's draft map only focuses on Old Town and Carlyle, though they have announced interest in future expansion into Rosemont, Del Ray, Arlandria, and possibly even into the West End. Meanwhile, I include stations along Mt. Vernon Ave and in Potomac Yard in my proposal. The city includes 6 stations "to be implemented by others", likely via development proffers. My map only has one since I was only aware of that one at the time I created it. Four of my station locations are at/near these proffers. It's still too early to tell just how the City Council will vote on this. Two councilmembers are on record as in support, but indications are that the others are either lukewarm or disinterested. We'll find out tonight with the voting.